The staff are friendly and helpful. Beautiful property located nears train and bus station in a short walking distance. Fast check in-out , Excellent view of the resort , Quited place for relaxing stay. The property is private. The actual property just like their shown photo. Fully equiped except hairdryer! Easy check-in, comfortable, clean and well equipped. Wifi available at the resort. Only 5 min drive from Hallstatt, Dachstein-West ski resort 25min away. We enjoyed our stay everything was exactly as we had imagined it to be, fast check in process great staffs spoke my language which that was a great plus😊for me. I will definitely return to Dormio resort in the summer, Sauna was great too and reasonable price for the whole day. The scenery near the lakeis magnificient! Especially during winter. Playground and indoor swimming pool are fun for kids. Lock in a great price for Dormio Resort Obertraun – rated 8.5 by recent guests! Dormio Resort Obertraun This rating is a reflection of how the property compares to the industry standard when it comes to price, facilities and services available. It's based on a self-evaluation by the property. Use this rating to help choose your stay! Free WiFi and a large wellness area with an indoor swimming pool, a steam bath, a hot tub and a sauna is provided at Dormio Resort Obertraun, 1,000 feet from the shore of Lake Hallstatt. You can dine in the on-site restaurant and sunbathe on the terrace which provides lake views. The well-equipped chalets all feature solid wooden furniture and several flat-screen TVs, while most are also fitted with a wood-burning stove, a private sauna or sun shower. A modern kitchen with a dishwasher is standard in all units. All bedrooms have a bathroom and each chalet comes with at least 1 balcony and a terrace. You can work out for free in Obertraun Resort’s gym and watch your children playing in the large garden or on the playground. Cold and hot drinks are available at the bar and a small grocery store is located in the lobby. The wellness area can be used for a surcharge. A ski storage room is available and the closest ski bus station is located right in front of Dormio Resort Obertraun. Cross-country skiing trails start right next to the complex and the Krippenstein-Dachstein Ski Area is a 10-minute drive away. You can park your car free of charge on site. UNESCO-protected Hallstatt is 3.1 mi away and Bad Aussee can be reached within 15 minutes by car. When would you like to stay at Dormio Resort Obertraun? This chalet consists of a living room with a fireplace, 2 bedrooms, each with a private bathroom and a sun shower in one of them, and a fully equipped kitchen with a refrigerator, dishwasher, microwave, oven and coffee machine. It additionally comes with a furnished terrace and balcony, as well as a nearby parking space. This chalet consists of 3 bedrooms, a living room with fireplace, a private sauna with shower, and a fully equipped kitchen with a refrigerator, dishwasher, microwave, oven and coffee machine. It additionally comes with a furnished terrace and balcony, a nearby parking space and 2 bathrooms. This chalet consists of 4 bedrooms, each with a private bathroom, a living room with fireplace, a private sauna with shower, and a fully equipped kitchen with a refrigerator, dishwasher, microwave, oven and coffee machine. It additionally comes with a furnished terrace and balcony, a nearby parking space and 2 bathrooms. This chalet consists of 3 bedrooms, a living room with fireplace, and a fully equipped kitchen with a refrigerator, dishwasher, microwave, oven and coffee machine. It additionally comes with a furnished terrace and balcony, a nearby parking space and 3 bathrooms with a sunshower in one of them. This chalet consists of 5 bedrooms, a living room with fireplace, a private sauna with shower, and a fully equipped kitchen with a refrigerator, dishwasher, microwave, oven and coffee machine. It additionally comes with a furnished terrace and 2 balconies, a nearby parking space and 4 bathrooms. This chalet consists of a bedroom, a living room with a sofa bed, and a fully equipped kitchen with a refrigerator, dishwasher, microwave, oven and coffee machine. It additionally comes with a furnished terrace, a nearby parking space and 2 bathrooms with a bathtub in one of them. This room is fitted with two single beds and a bathroom with bathtub. Private parking is possible nearby. This studio comes with a bathroom, a living area with sofa bed, and a fully equipped kitchen with a refrigerator, dishwasher, microwave, oven and coffee machine. Private parking is possible nearby. This chalet consists of 3 bedrooms, a living room and a fully equipped kitchen with a refrigerator, dishwasher, microwave, oven and coffee machine. It additionally comes with a furnished terrace, a nearby parking space and 2 bathrooms with a bathtub in one of them. This chalet consists of 8 bedrooms, a living room, a private sauna with shower, and a fully equipped kitchen with a refrigerator, dishwasher, oven, coffee machine and 2 microwaves. It additionally comes with 2 balconies, a furnished terrace, a nearby parking space and 4 bathrooms. We have been voted best holiday park in Austria for the last 3 years. That kind of says it all. It's the unique setting between the mountains and lake Hallstatt in UNESCO World Heritage that makes it so special I guess. My name is Boudewijn and I work for Dormio. We have developed Resort Obertraun. I live in the Netherlands myself, but whenever I have the chance, I visit Resort Obertraun. I always come back completely relaxed! We were a bit overwhelmed by the amount of Asian guests that is still increasing. The resort is close to Hallstatt, which is a huge attraction. It can be reached by car, train, bicycle, bus or boat. House Rules Dormio Resort Obertraun takes special requests – add in the next step! Dormio Resort Obertraun accepts these cards and reserves the right to temporarily hold an amount prior to arrival. The mandatory resort fee includes the final cleaning fee, bed linen and towels. Turndown service is only once upon arrival. Please note for bookings of 4 or more rooms, different conditions may apply. Location is very good, The house is large and very clean. The kitchen is great, there is everything i need for cooking. I wish to go back there again!! For first floor is a single bed(sofa bed) The bed is not comfortable as a swamp pool. View very beautiful .There is the first floor and the second floor. The first floor is a single bed(sofa bed). There is a kitchen, a small bathroom, 2nd floor is a double bed, the bathroom is large, comfortable to sleep. Nothing. Tip : if you need hair dryer, can borrow upon check in. The scenery is fantastic!The living room is specious and with a kitchen we can cook simple food. It was a nice expirenment. This time we have the room close to rail, so it's a little bit noisy. Check in takes long time. Reception is not polite and not kind. Only one small set shampoo for 8 people (better not give, so sticky, narrow heart) Breakfast is too poor, never seen like this before. 15€ per person. Egg, muesli, bread, small cake old tomaten/orange/apple/tomato Poor jam, butter, bread Long time waiting for cafe machine. One personal A lot of customers. Bad resort. Greedy resort in my opinion. I hate Formic Resort's management. Maybe the hotel could provide some free bottled water and wood for the wood stove. 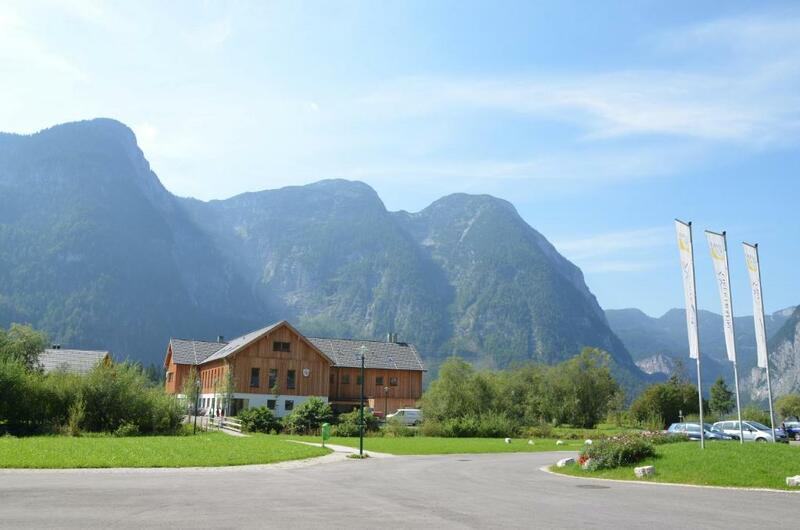 Location is great because we drove so we can stay a short distance from Hallstatt and we can get value for money. The view from Obertraun is just as great and we could park just beside our chalet. Lovely. The heater was good and kept the whole chalet nice and warm when we returned to our chalet after a day's outing in the freezer!! Shower was great but the solar heater in our unit was not working although the one in room 2 was ok. We didn't use it. The dinner from the restaurant was good too. The chalet was clean. We would like to stay a day more if time permitted. Even though it's self catering we found the lack of even a tea bag a little dissapointing upon arrival. Maybe just a few coffees and teas as a welcome gift?